SEOUL, Feb. 12 (Yonhap) -- South Korean stocks closed slightly higher on Tuesday as investors took a wait-and-see stance on ongoing Washington-Beijing trade talks. The local currency rose against the U.S. greenback. The benchmark Korea Composite Stock Price Index (KOSPI) added 9.74 points, or 0.45 percent, to finish at 2,190.47. Trading volume was moderate at 423.29 million shares worth 5.75 trillion won (US$5.12 billion), with gainers outnumbering losers 412 to 404. Analysts said investors are waiting for clearer results of the trade negotiations between the United States and China. Hopes were high as recent news reports indicated U.S. President Donald Trump and his Chinese counterpart Xi Jinping will likely hold a summit meeting next month. 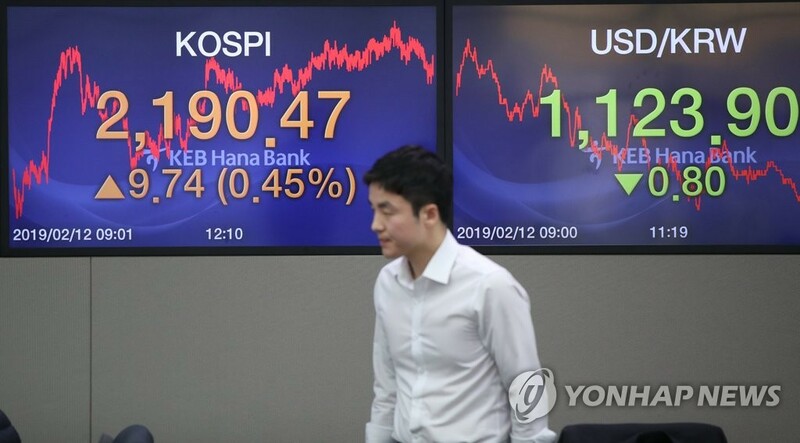 "Global markets see-sawed as investors tried to remain cautious until the end of U.S.-China talks," Seo Sang-young, of Kiwoom Securities, said. "There was some optimistic news from Washington, which propped up the KOSPI to some extent." Chip shares led the increase, with Samsung Electronics, the world's largest memory chip manufacturer, rose 2.33 percent to 46,050 won and SK Hynix gained 2.43 percent to 75,900 won. Leading life insurer Samsung Life Insurance climbed 0.79 percent to 88,800 won and Hyundai Marine & Fire Insurance went up 2.26 percent to 38,450 won. Hyundai Heavy Industries, South Korea's largest shipyard, dipped 0.76 percent to 130,500 won after being the sole candidate to take over heavily indebted Daewoo Shipbuilding & Marine Engineering. No. 3 Samsung Heavy, which pulled out of the race for Daewoo Shipbuilding, advanced 2.92 percent to 8,810 won. On the other hand, NCsoft, a leading gamemaker, tumbled 4.20 percent to 433,500 won despite a strong earnings report, while Netmarble fell 0.84 percent to 118,000 won. The South Korean won traded at 1,123.9 won against the U.S. dollar, up 0.8 won from the previous session's close. Bond prices, which move inversely to yields, ended lower. The yield on three-year Treasurys rose 1.5 basis points to 1.796 percent, and the return on benchmark five-year government bonds added 1.9 basis points to 1.856 percent.